An explosion of blooming flowers, energy and lightheartedness. 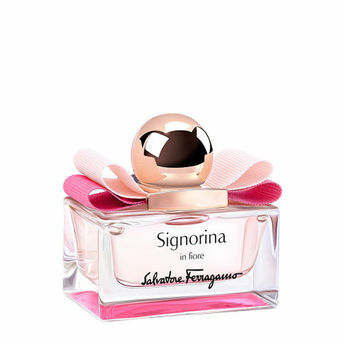 Signorina in Fiore by Salvatore Ferragamo is a fresh and lively Eau de Toilette in which delicate floral notes joyfully blend with juicy fruity shades. The journey begins with exciting and colorful notes where vibrant Nashi Pear Sorbet gracefully blends with juicy Pomegranate. The heart of the fragrance is a crescendo of enchanted flowers, Cherry Blossom and transparent Jasmine petals charmingly illuminate the scent. A profound lightness embraces the senses leaving a tender trail of soft White Musk and creamy Sandalwood. Explore the entire range of Perfumes (EDT & EDP) available on Nykaa. Shop more Salvatore Ferragamo products here.You can browse through the complete world of Salvatore Ferragamo Perfumes (EDT & EDP) .Alternatively, you can also find many more products from the Salvatore Ferragamo Signorina In Fiore Eau de Toilette range.